Dundurn Parish Church is a picturesque and carefully detailed church, dated 1878, by the architect G T Ewing of Crieff. The church, like most buildings in the village is orientated towards Loch Earn, enjoying views across the E end of the loch. The principal elevation is distinctive within the landscape because of the vivid red bargeboarding and yellow dressings against the dark whinstone of the walls. 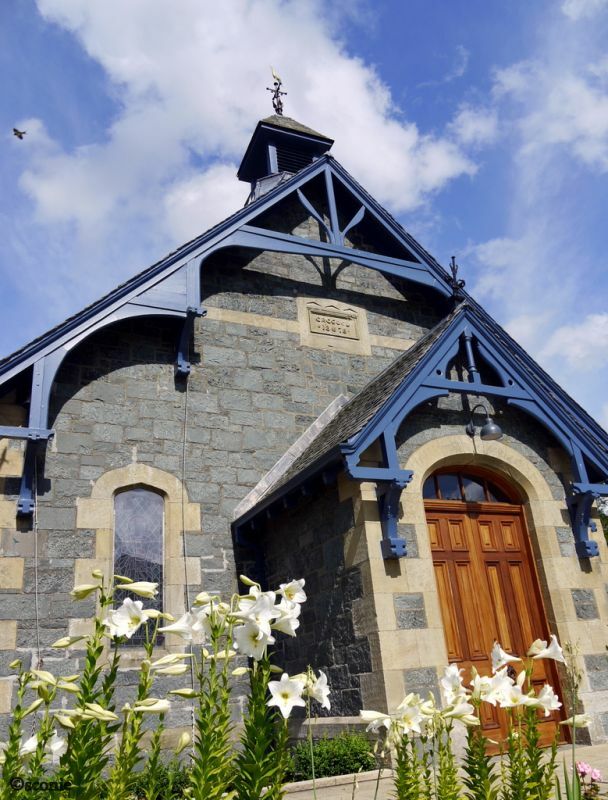 A well preserved village church, making a decorative contribution to the streetscape and the work of a significant architect working in the Trossachs area in the late 19th century. The church sits to the rear of a long, narrow plot orientated towards the lochside road. The gabled main elevation is a simple composition, with a central gabled porch and flanking windows. An ashlar plaque to the upper central gable is inscribed, 'ERECTED/1878' The gable is topped by a small, square plan bell-cote, on a lead base with slatted timber sides and a piended roof with weather vane. A short 3-bay, rectangular plan nave (with no transepts) is ended by a semi-hexagonal apse, the apse roof piended back to the nave roof ridge. The large nave windows are elliptically arched, whilst the smaller windows of the apse and S wall are tudor-arched. A small vestry sits to the E side of the apse, with doorways into the church and to the S exterior, and a further, lean-to brick-built room sitting to the N.
Entry into the church is through a set of timber-panelled double doors, with a segmental-arched fanlight above, into the small entrance vestibule. The vestibule in turn leads directly into the nave, through a set of narrow, panelled double doors. The church interior is surprisingly high, divided into a shallow 5-segment vault; a horizontal central strip is flanked by sloping sections and meets the nave wallhead with gently curved outer strips. The groins at the intersections of these strips are hidden by simple ribs, springing from a similar moulded cornice at the wallhead. The use of colour is very important to the architecture of the church, allowing the design to remain very simple yet still striking. Externally, the contrast between the yellow sandstone dressings and the near black whinstone walls gives the elevations movement and interest, without the need for mouldings or stonework. The shaped bargeboards of the S elevation are advanced far over the eaves, supported on timber brackets. This creates a dark shadow behind the bright red paint, exaggerating the depth in the façade. Internally there is again contrast between the dark oak of the panelled lower walls and chancel furniture, and the simple, neutral colours of the walls and ceiling. The stained glass of the windows brings vibrant patches of warm colour into the church, breaking up the cool, cavernous feeling of the interior, where the celtic knotwork carvings of the chancel furniture and the simple moulding of the window surrounds and vault ribs are the only additional adornments. The decorative fixed timber pews are still intact. Materials: squared and snecked whinstone; yellow sandstone ashlar dressings. Carved and jointed timber bargeboards and brackets. Rectangular lead-paned, red and yellow stained glass, set into 4-pane timber windows. Pitched, grey slate roof; decorative terracotta ridge tiles. Wrought-iron weather vane to bell-cote; wrought iron, floreate finial to porch. Ecclesiastical building in use as such. Dundurn Parish Church is the church of a 'quoad sacre' parish, split from Comrie Parish in 1895, deemed necessary because of the growth of population in the St Fillans area. Although the present church building was 1879, and a minister for the area was ordained in 1881, the church and its minister did not officially become Dundurn Parish Church until the creation of this parish, which continues to function today. The church is thought to be the work of G T Ewing, who made a significant contribution to the area as the architect to the Willoughby D'Eresby family and their Drummond Estate, remodelling their Drummond Castle home, building St Angus's Chapel in Lochearnhead and Comrie Free Church. He also created a plan for the extension and feuing of St Fillans, which would have extended the village NE and to the S of the loch, but was never executed. On this plan was an alternative elevation for Dundurn Parish Church, with an elaborate bell tower to the main elevation. An early photograph of the church also shows the bell-cote to have had an onion dome, now replaced by the piended square example seen today. The oak panelling and chancel furniture were later additions to the interior of the church, donated in 1923 and 1931 by James Macfarlane of Macfarlane, Lang and Co, bread and biscuit manufacturers in Glasgow, who had a house in St Fillans. The church is also notable for the baptismal font, a stone bowl set into a iron pedestal. This stone bowl is said to be medieval, the original font from the pre-Reformation church at Dundurn.